The highly acclaimed local artist David Birtwhistle gave a very successful illustrated talk to a full house at the Baptist church. His generosity in allowing the audience to handle and look closely at some of his drawings and paintings was very much appreciated and a great deal of his work was on display, with prints & greeting cards available to purchase. A big thank you to David from Pershore Arts for an entertaining and informative evening. Richard Lockett gave a fascinating talk on landscape artist John Constable. We heard that Constable was never happy with his work and struggled for public recognition during his lifetime – interestingly, the French were the first to recognise his talent. Thank you Richard for an enjoyable and informative evening. Our Annual Exhibition gave our members the opportunity to display their wealth of talent and diverse styles. The work was on show at Number 8 Community Arts Centre from 9th – 29th May. You are invited to an exhibition of Tor Hildyard's work: Elephants of Coughton. There will also be a silent auction to raise money for the Elephant Family Trust which takes place at 7:30 pm on Friday 14th June at Coughton Court. The exhibition continues until Sunday 28th July. Pershore Arts' ‘Smallest Art Exhibition in the world?’ was a resounding success! Opened by two of the youngest villagers, Freddie Stewart (aged 5) and sister Molly (aged 8), the exhibition was held in Pensham telephone kiosk. Original works, all measuring 6” x 4”, were available at the bargain price of £5 each. The three day exhibition attracted a lot of visitors and over 30 works were sold. The exhibition was given coverage on BBC Hereford & Worcester and also featured in Worcester News. Our Summer Social took place on Thursday 25th July. It was a perfect evening cruising along the River Avon. It was well attended and a good time was had by all. Here are some photos taken during the event. Pershore Arts had a high profile at the Plum Festival this year. Visitors were able to see members working at their easels in Plum Parade (Church Street) or, when not slapping paint on their own canvases, they could also be found helping members of the younger generation paint a mural. Others were busy staffing the Pershore Arts exhibition held in a local vacant shop. So it was a busy day all round. Pershore Arts member, Gemma Farr ran a silver jewellery workshop at Three Little Pigs, Pershore on Sunday 22nd September. See www.gemma-farr.co.uk for information about her latest courses and independent workshops. The demonstration of Caran D'Ache coloured pencils proved to be very informative and was attended by a large group of Pershore Arts members & friends - we almost ran out of seats! We were impressed and inspired by the excellent examples of work created using these pencils. One of our members was assured that the set of pencils which had lain in her art cupboard, unused for 20 years, would still be perfectly useable! On 3rd October Marianne Vincent demonstrated the making of 3D textile vessels, using soluble fabric. Techniques were demonstrated and questions answered to point you in the right direction to make your own. On 17th October Number 8 beamed in a fascinating talk about Vermeer (of "Girl with the Pearl Earring" fame) and the way music influenced his life and art. This was given by Tim Marlow from the National Gallery to coincide with their Vermeer exhibition. On 14th Nov, work began on our contribution to Pershore’s newly refurbished library - three painted panels on the theme of reading. With an enthusiastic response from our members, by the end of the first evening the images were already taking shape. 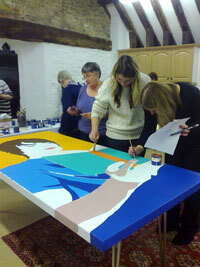 A second session on 21st saw the canvases very near completion, with just a few final touches needed. Thanks to everyone who has helped with the project - look out for the results - coming soon to a library wall near you! Our Christmas social took place on 28th November at Thai Legends restaurant on Pershore High Street. December 5th was the last chance to make Christmas wreaths - a simple yet effective decoration - featuring sweets! Geoff lead the last Photography group meeting of 2013 on Thursday 19th December - the theme was layers (think of stacks - one thing on top of another). For those that don’t care for set subjects, they had the option to bring any recent photographs to share with us. Information on exhibitions, competitions and books is always welcome and interesting plus anything else you might like to talk about.